Even though we all claim to value education, teaching and learning is rarely done well. To achieve good outcomes, teachers and students must understand how the brain learns. Unfortunately, few teachers have more than a passing acquaintance with the science of learning. Many of the strongly held and frequently espoused notions about learning practices (e.g., good study habits), which seem intuitive, are dead wrong. Scientific investigation into the learning brain has revealed a great deal, especially in recent years, but the findings seldom reach the teachers and learners who would benefit from them. 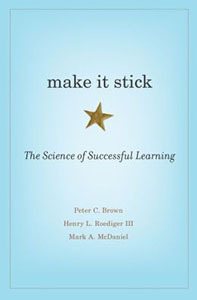 Peter Brown, Henry L. Roediger III, and Mark A. McDaniel have responded to this problem in the form of a wonderful new book titled Make It Stick: The Science of Successful Learning (2014). Don’t confuse this with another fine book titled Made to Stick (2007) by brothers Chip and Dan Heath, which teaches how to get messages across in clear and compelling ways. Make It Stick presents in accessible terms the latest research findings regarding learning, both for people who want optimize their own learning efforts and for teachers who want to create successful learning experiences for their students. By learning, the authors mean “acquiring knowledge and skills and having them readily available from memory so you can make sense of future problems and opportunities.” They’re not talking about simple recall. Learning involves memory, but extends beyond mere recall into the realm of application. Real learning is “effortful.” For example, “When you’re asked to struggle with solving a problem before being shown how to solve it, the subsequent solution is better learned and more durably remembered.” Effort alone isn’t enough, however. It has to be the right effort. To apply knowledge and skills to new problems and opportunities when they arise, we must possess more than procedural familiarity; we must have a conceptual understanding that is generalizable. “People who learn to extract the key ideas from new material and organize them into a mental model and connect that model to prior knowledge show an advantage in learning complex mastery.” We can all become better learners by developing better learning practices. One such practice is frequent testing. Whether you’re studying on your own or in a structured learning setting, frequently testing your understanding and ability to apply what you’re learning strengthens it and provides the feedback that you need to focus your efforts where they’re most needed. Many popular beliefs about learning, such as the benefits of cramming (a.k.a., massed practice) and rereading material over and over, are flawed. The ability to perform well on a multiple-choice test soon after cramming or rereading material is short-lived. Spaced practice, interleaved with other material, results in better learning than non-stop focus on a single topic or skill. Some of the best learning practices are counter-intuitive and don’t necessarily feel like progress during the learning process itself, even though they dramatically outperform other practices that feel more productive. Some beliefs about learning that have garnered attention in recent years are downright wrong. One that I’ve encountered frequently in my own work is the notion that people learn best when they engage in the learning style that they prefer. The popular notion that you learn better when you receive instruction in a form consistent with your preferred learning style, for example as an auditory or visual learner, is not supported by the empirical research. People do have multiple forms of intelligence to bring to bear on learning, and you learn better when you “go wide,” drawing on all of your aptitudes and resourcefulness, than when you limit instruction or experience to the style you find most amenable. Our brains are designed to think in several modes (e.g., verbally, numerically, and visually), which we should shift between fluidly, as needed, depending on the nature of the material and the perspective from which we wish to consider it. Fundamentally, the purpose for which we pursue the acquisition of information and skills has a significant effect on learning. There is a huge difference between focusing on performance versus focusing on learning. In the first case, you’re working to validate your ability. In the second, you’re working to acquire new knowledge and skills. People with performance goals unconsciously limit their potential. If your focus is on validating or showing off your ability, you pick challenges you are confident you can meet…But if your goal is to increase your ability, you pick ever-increasing challenges, and you interpret setbacks as useful information that helps you sharpen your focus, get more creative, and work harder. Although I was already familiar with much of the material in this book, because of extensive reading about learning theory, 40 years of reflective teaching experience, and a lifelong love of learning, a great deal was new to me. Enough, in fact, that I will soon be redesigning my table and graph design course, Show Me the Numbers, to last two days rather than one so I can add frequent tests, additional discussions, and many more group exercises to guarantee that my students leave with a stronger foundation to build on. I’ve been teaching the concepts well, but not fully providing the learning experience that will make those concepts stick. As an advocate of non-traditional learning I have read books by Holt, Gatto, Illich, and Robinson. Although Ivan Illich was the earliest writer on the subject that I have read, his insight was uncanny. His books, especially “Deschooling Society” paved the way for the movements in home schooling, unschooling, and charter schools. It sounds as though this research validates what Illich and these others have been saying for 50+ years; institutional “education” is fundamentally flawed. Illich felt that it is beyond reform and needs to be abandoned. Unfortunately, most “professional” teachers are schooled in methods that are best for the instructors, so that they can deliver “education” efficiently. I am eager to read the findings from this book. The authors of this book are not saying that “institutional education” is fundamentally flawed. The information about learning that the authors share are no better understood in general by those who are involved in home schooling and charter schools. Effective learning practices can be incorporated into institutional education just as easily as into any other educational setting. In my opinion, our system of public education could serve wonderfully if we valued education enough to motivate the best and the brightest to become teachers, in part with the promise of a respected profession, properly compensated, and then trained them at top-notch schools of education. This approach has worked well in Finland where public education is superb.